I am not a fan of mushrooms. I will eat them sliced very thin in our salads, but I don’t want to eat them pretty much any other way. Waldo however loves mushrooms, he eats them with steak (well he did before he went pescetarian), on pizza, on just about anything he can. I read in How to Cook Everything Vegetarian that people that convert to vegetarianism have to change the way they think about meals. Meat eaters have a meal that centers around a main dish (meat usually) and then a side dish or two. Vegetarians usually eat what amounts to a bunch of sides and that is how its suppose to be. These grilled mushrooms made a great side to add to Waldo’s plate. Waldo loved, Loved, LOVED these mushrooms. They were easy to make and he said it was like eating meat. He never believed people when they said that mushroom cooked the right way could taste like meat, but he believes it now. He said that at first he tasted a really good steak and the rest of the bites were pork. 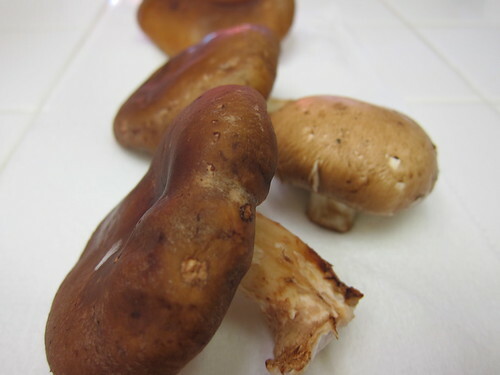 He is a big fan now and says that these mushrooms need to be on our weekly menu. Speaking of weekly menus we have a very boring selection of food options, this is mainly my fault as I’m the pickiest person you will likely ever meet. We have about 8 dishes that we rotate through, so our dinners are pretty routine. I’d like to add options and broaden our menus. I want eating to be healthy and really enjoyable. My goal for the next few months is to get a wider array of food options for my family. If anyone has any suggestions I’d love to hear them. We made 2 shiiitakes and 1 cremini. I cut the sauce amount in half and it was still a little more then I needed, but not by much. I didn’t get a picture of the finished mushrooms because Waldo was enjoying them too much to let me at them. Heat the grill until quite hot and put the rack about 4 inches away from the hear source. Mix the EVOO, shallot/garlic, thyme, salt and pepper. Brush the mushrooms all over with about half the mixture. Grill or broil the mushrooms with the top of their caps away from the heat until they begin to brown, 5 to 8 minutes. Brush with the remaining oil and turn. Grill until tender and nicely browned all over, 5 t 10 minutes more. Garnish and serve hot, warm or at room temp.